Good looking, quick to inflate and great for unwinding, the Vango Inflatable Chair is hardwearing and comfortable. Made from soft flocked PVC, it provides a pleasant surface to recline on which will also do no harm to groundsheets, carpets or the tent itself. It blows up quickly and with the skirt on the bottom it adds a bit of height. It is a handy little seat to have packed away in your camper. The bottom skirt was a bit difficult to blow up because the valve was a much smaller one which we did not have an adaptor for. I have used this chair a couple of times now and it's great and stores away neatly. It's a touch lower than I'd imagined but is still comfy. Excellent customer service and would definitely use this site again. 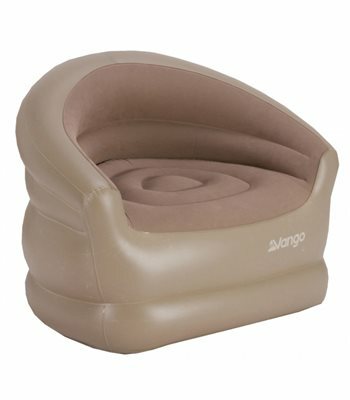 Very comfy inflatable chair , deflates down to a flat easy to pack item.